Nearing the end of April, we begin Golden Week celebrations in Japan with Showa Day. Sparking the beginning of this week-long celebration, this holiday highlights the strong historic character Emperor Showa. 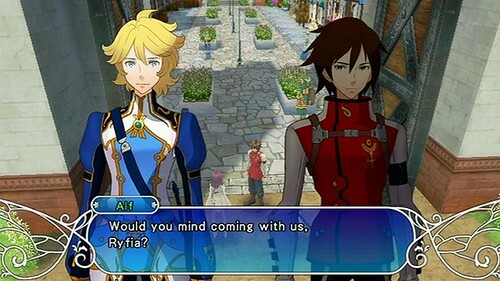 In Arc Rise Fantasia, players are introduced to characters of strong moral fiber and heroic nature as well. These characters lead players to epic battlefields and draw them into a deep story that achieves a perfect balance of humor, emotion and action. Arc Rise Fantasia's cast of unique characters is led by L'Arc, a mercenary of the Meridian Empire. As L'Arc gallantly battles dragons with fellow soldiers, he finds himself rescued by Ryfia, a Diva from the Turmelian Republic, which is at war with the Meridian Empire, and together they embark on a perilous journey. However apprehensive L'Arc may be about his pre-destined path, his companions Prince Alf and fellow mercenary Niko, help him find his way. On their journey, our heroes face a number of unlikely friends and foes. Tensions mount as L'Arc's childhood friend Adele becomes jealous of his bond with Ryfia. Leslie, a flirtatious yet powerful acquaintance, appears to have her own agenda while Serge, a bandit, unexpectedly helps the team narrowly escape from the small but deadly, mysterious assassin sisters, Luna and Paula. Although L'Arc and his friends encounter many dangers throughout their mission, L'Arc is still often caught off guard by unexpected enemies and surprising circumstances. In every JRPG there are characters that make adventures more memorable. Players will find themselves laughing as Niko, L'Arc's sidekick, screams in fear at the very monsters he was hired to slay. Or as Ryfia makes nonsensical comments demonstrating her complete lack of knowledge about the world at large. Players will not only be able to command these characters, but many more as the story progresses and our heroes decide where their true loyalties lie. With every twist and revelation, Arc Rise Fantasia draws players into the lives of its memorable cast.